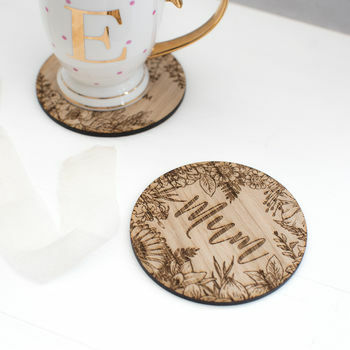 Our gorgeous wooden coaster makes the perfect mother's day gift or birthday gift, feauturing and engraved botanical design and 'Mum' wording. Featuring the word 'mum our engraved coaster is a unique and thoughtful gift for your mum this mother's day, and will take a permanent place in her heart and home. Engraved and laser cut in our cheshire studio, the process involves burning wood so some smoke marks may be present, however we feels this adds to the products charm! Engraved in our cheshire studio, this wooden coaster will last for years to come.